Stacy Horn » Blog Archive » When Did I Become a Science Nut? When Did I Become a Science Nut? This is a picture of inventor Nikola Tesla. When I was a grad student at NYU, a professor from MIT named Richard Jay Solomon used to come down once a week to teach a course about the history of technology. His stories about these scientists, and their inventions and discoveries were so good I couldn’t even take notes. I was afraid I’d miss something. 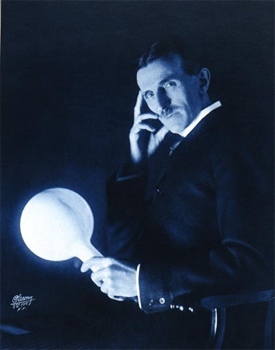 He was fascinated by Nikola Tesla, and told us about him, but Tesla was one of many. You just wouldn’t believe how exciting these stories are. So, I handed in my book yesterday, but I’ve already been mulling over what to do next. Just a few minutes ago I was reading a review about a new novel based on Tesla, which sounds fabulous, I must have it: The Invention of Everything Else: A Novel by Samantha Hunt. It got me thinking. I write nonfiction, and I get the sense that publishers are not thrilled with biographies, I imagine they don’t sell well, but that’s okay. I would love to find some thrilling moment of time in science, and write a book about what led to it. One of the hard parts about the Duke book, was trying to represent science and statistics so that not only could people like myself understand it, but it would read like a page turner. What was probably common knowledge for any student of science was news to me. And actually, once I understood it better, I was able to judge what I could leave out so it didn’t become burdensome, and only included what I needed to show how they got from here to there, from experiment to experiment. I’ve been thinking I’d like to do a book about audio forensics, and I’m starting to get an idea of how I might do it. I’m not quite there yet, it’s all kinda swirling around in my head, but it’s starting to come together. It has to do with how freaked out I got listening to some of these cockpit voice recordings, and a 911 call from inside the Trade Center. I mentioned this on Echo and someone who works at the Medical Examiners office said she gets more freaked out by things she hears on films that she looks at as part of her job, more than what she sees. And swirling around in there is some things I learn about audio hallucinations, and EVP, and more. Actually, I may even tie it back to some things I learned from Richard Jay Solomon about the invention of the telephone. It would also be a good excuse to spend some time at the Bell Labs archives, which would be my idea of heaven. Oh, thanks for saying that. I worry that they might not be all that interesting.